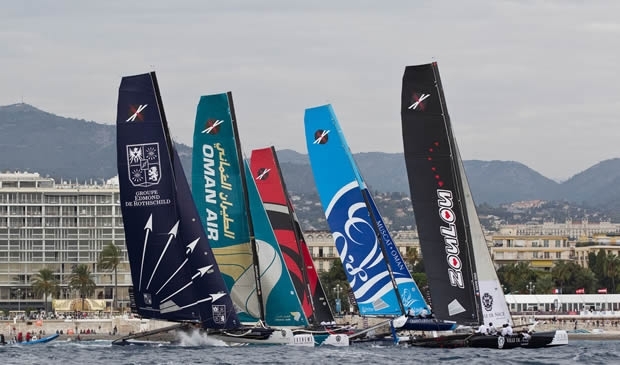 The penultimate day of the Extreme Sailing Series Nice was again held in breeze, the easterly wind blowing along the beach making it challenging for the competitors to read the conditions. As Oman Air's Tornado silver medallist Charlie Ogletree observed: "There were two breezes – the gradient easterly that was trying to come from the right and there was the land effect coming off the shore. Earlier in the day it was a lot more stable and generally the right easterly were paying but as it got later in the day the offshore got more prevalent, there was an area not much wind in the middle and both edges were really good and it was hard to pick which edge every time." On the plus side Phil Laurence's race management team gave the boats an upwind start rather than Friday's confined reaching starts directly off the beach that resulted in several collisions. Nine races were held and at the end of this Groupe Edmond de Rothschild has edged into the lead but with the Oman Sail boats, The Wave, Muscat and Oman Air, four and ten points away from her respectively, while an average day for yesterday's leaders, Roman Hagara's team on Red Bull Extreme Sailing, has dropped them to fifth in the eight boat fleet. That The Wave, Muscat was racing at all today, came after the all-night effort of her shore crew lead by Jo Lees and his Omani boatbuilders Mohammed al Shukali and Hilal Al Zidjali to repair the damage left after their boat was T-boned by Alinghi on the start line of Friday's final race. The Wave, Muscat was only relaunched at 1030 this morning and you would be hard pressed to spot the repair. “I’d like to say a big, big thank you to all the shore crew,” said The Wave, Muscat crewman Hashim Al Rashdi. “They finished this morning and the boat is really good.” Leigh McMillan duly went out and won today's first race. Another person on the team who had little sleep last night was The Wave, Muscat’s ‘fifth man’ Olympic 470 silver medallist Hannah Mills, who jetted back to the UK last night for an RYA awards ceremony, but was back on the dock in Nice this morning. The shape of the leaderboard going into the final Extreme Sailing Series event in Rio de Janeiro in December will be decided tomorrow by 1700 local time. Can Groupe Edmond de Rothschild hold off The Wave, Muscat and win on home waters for the second year in a row?